The forlorn little rag dolls are so dejected-looking, so pitiful, they beg for love and ownership. Their embroidery eyes are sewn on crooked and other facial features are expressionless. Their limbs are misshapen and disproportionate. One can only guess what stuffing is inside. Their clothes are made from scraps of tattered materials. You aren’t drawn to purchase these dolls for their appearance or their quality. You feel a need to rescue them. The dolls beckon the passerby with a certain charisma, a quality, a crude charm for their primitive, raw state. They grow on you. On the first day I simply walk past them, giving only a casual glance. Later I become haunted by a persistent longing for one of the little figures and begin searching in earnest. No sellers appear on days two or three. I think I missed the opportunity. On day four the “doll ladies” re-appear, setting up at the end of the sidewalk waiting for us. 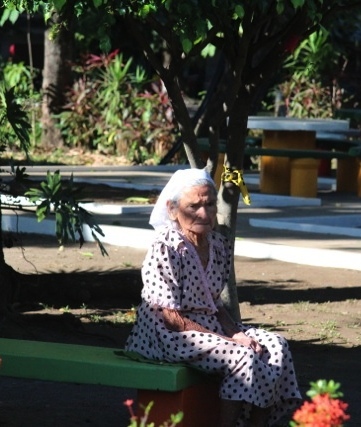 Our hotel in Sonsonate is part of a planned community – the vision of a Chicago pastor. The area includes a hotel, retirement home, school, church, camp, store, radio station, vocational tech school, and restaurant. The nursing home is directly across the street from the hotel. The restaurant is beside the nursing home. The elderly women residents of the nursing home who make the dolls have a prime marketing position as we walk to the restaurant for breakfast in the mornings. 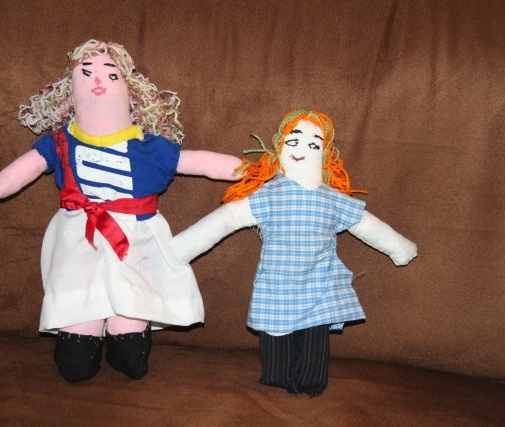 By purchasing the dolls we validate their creativity and their hard work, we give them some fulfillment and dignity in what remains of their life.